Today we return to Fedor’s Pass. While not one of the original “Lost Dungeon” maps that I drew in pencil when I was creating Fedor’s Pass, I drew this one afternoon to fill in one of the missing levels from that megastructure. Below the palace level indicated on the map are three levels marked with a “?”. I’ll be referring to these levels as the Palace Sub-Levels (although they can be accessed without actually going to the Palace level as the top and bottom sublevels are linked to the Great Stair). For the full collection of what’s currently been mapped for Fedor’s Pass, click on the Fedor’s Pass tag on the upper left of this post. 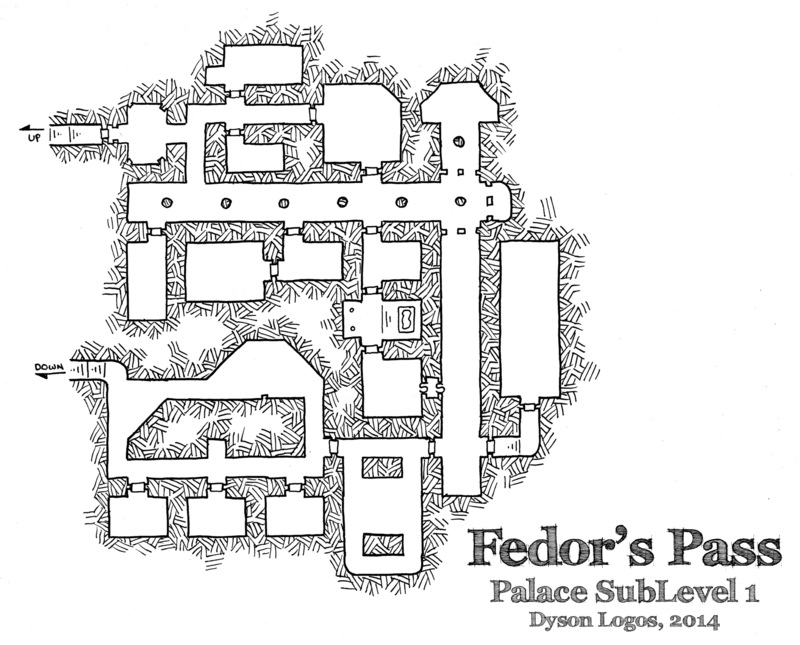 The whole collection of Fedor’s Pass is your’s to use non-commercially thanks to the awesome patrons who support the Dodecahedron through my Patreon campaign. Like what you see here, and want to help me make more? Consider throwing a few nickels my way – Dyson’s Patreon Campaign. Yay! So glad you have gone back to this to fill in the blanks, its one of my favourite mega dungeons you’ve made, possibly because the side overview if an interesting layout, not just the individual layers. I’m about half way through making a replica of it to explore in minecraft, just to see what if feels like to explore as a space in 3d. I know you said you are going to map the Palace Sub-Levels and the 3(or 4?) unmapped caves, but are you going to do a new map for the level between the palace and the keep or just leave it as the “Circle of Doom”? I had all the 2010 maps and was deciding what direction to go with the unfinished parts when you posted this. Now I’m going to hold off for a while to see what you have planned.